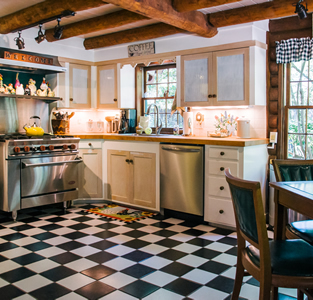 undance Lodge, named for its bright and sunny interior, is a luxurious, spacious log home that brings the natural beauty of the outdoors inside to you. It has 3 bedrooms and 2.5 baths, accommodates up to 8 adult guests and is approx. 2800 sq. feet. 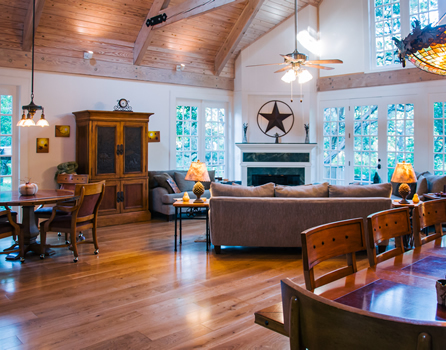 • The Sunrise Suite which boasts views of towering live oaks and sweeping grounds. • The Lily of the Valley Room which sits high in the treetops, with its skylights providing a front row seat to the big and bright Hill Country stars. • The Play Room which features antique toys, games and books and promising to bring out the kid in you. All bedrooms are newly appointed with lush, ecologically friendly wool flooring. Sundance also includes an expansive Great Room and an inviting pine log Den with overstuffed chairs and stone hearth. 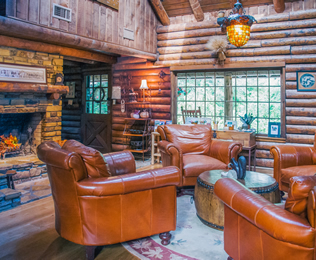 Approximately 2800 square foot, 2-story luxurious log home. 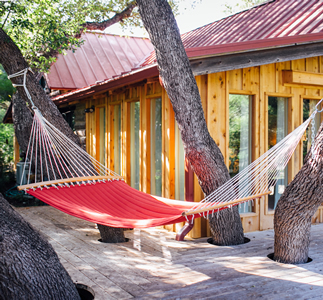 Accommodates up to 8 adult guests. 3 bedrooms and 2.5 baths.